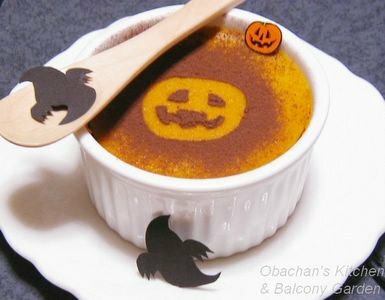 Pumpkin Pudding ... with some guests? This evening I saw on the TV news that a local English conversation school here in Kochi took kids (students) out for trick-or-treating today. Looks like Halloween is becoming more popular even in this rural area, and soon October 31st will officially be a “mischievous night” here. I made pumpkin pudding this morning before going to work and left it on the kitchen table. After coming back from the izakaya work tonight, I enjoyed the pudding after my late night supper. It tasted OK, but... I don’t know… Is this just me or were there some unusual guests hanging around my pumpkin pudding? Do you, too, see them in the pics? 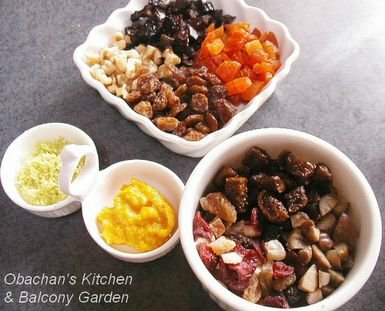 OK. Now I’m done with the step 1 of my Xmas fruitcake project 2005. I finally soaked some dried fruits and nuts in liquors this morning. I had a quick and easy spaghetti dish for lunch today. The recipe was on the tag attached to the balsamico vinegar (by Mitzkan, a Japanese vinegar brand) I bought yesterday. 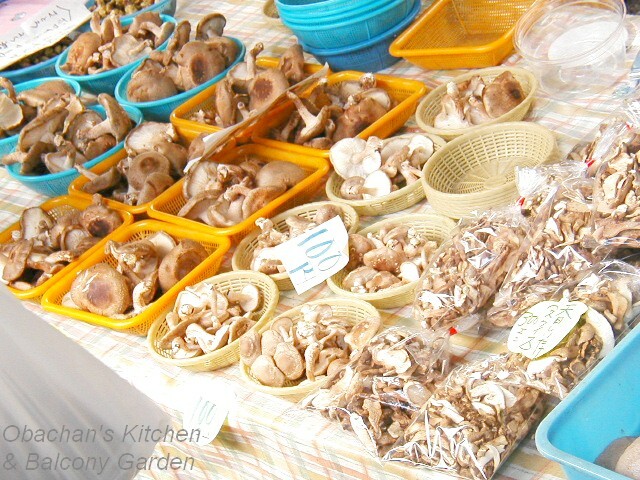 It was a “chicken and tomato spaghetti” recipe and also called for shimeji mushrooms, but I substituted the chicken with salmon and shimeji with eringi mushrooms. 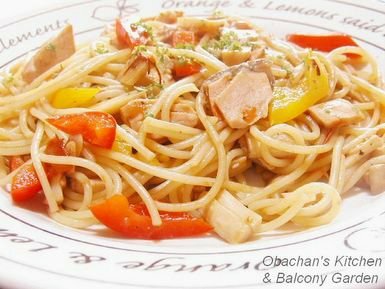 I have never tried seasoning spaghetti with balsamico vinegar before, and found it very tasty today. Too bad that I chickened out and didn’t add enough garlic. (I was going to see some people after lunch.) Next time I’ll try it with more garlic and maybe scallops. This morning I woke up earlier than usual and wanted something different for breakfast. Today is going to be a busy day with both daytime and night-time work, and I thought a “different” breakfast would put me in gear. 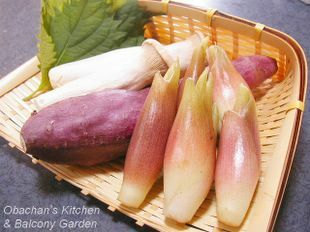 Myoga ginger always reminds me of summer, but actually autumn is another myoga season. Inspired by bilbo’s recent comments, I bought some today and tried a few dishes that I haven't made for a long time. To be perfectly honest, I hated myoga so much when I was a kid. I would go on a hunger strike when my mom secretly put some in the miso soup. ;P Now I can live with miso soup with myoga, but still today, I really need to force myself to eat the thin strips of raw myoga placed on top of cold noodles as a condiment. I guess I can really enjoy myoga in only 3 dishes: sweet & sour pickles, salad with sumiso (vinegar-miso) dressing and tempura. 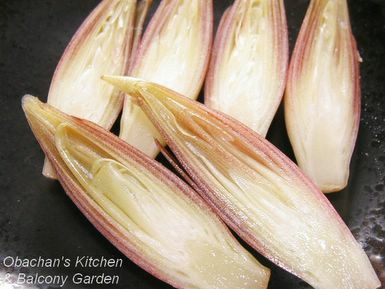 Cut myoga in half (lengthwise), sprinkle with salt and leave 15 to 20 minutes. 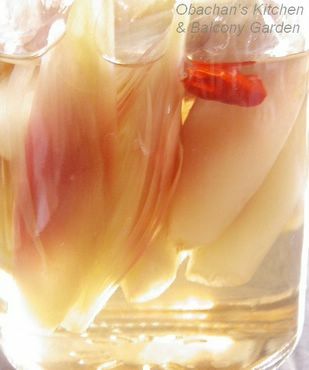 Combine vinegar, sugar, and mirin in a saucepan, add chili pepper and bring to boil. Remove from heat and let cool. 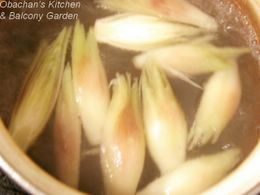 Blanch myoga in boiling water for 2 to 3 minutes. Drain and cool for apx. 15 min. 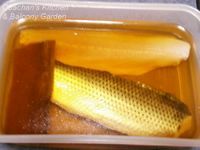 Soak myoga in the sweet & sour mixture overnight. 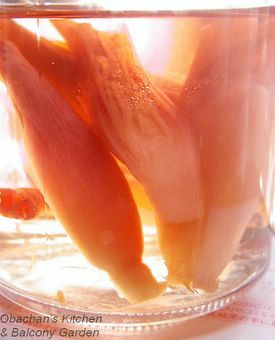 The outer layer will turn into pretty reddish pink in vinegar. It’s really pretty and will be prettier on the next day. 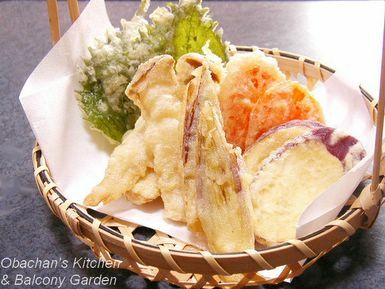 When I make tempura, I always use several different ingredients; I almost never make one-ingredient-only tempura. Today I used a sweet potato, eringi mushrooms, green perilla leaves and carrot (not included in the pic above) in addition to myoga. 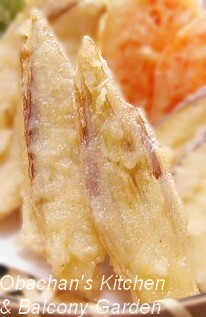 For tempura, you can just cut myoga in half and batter-fry. 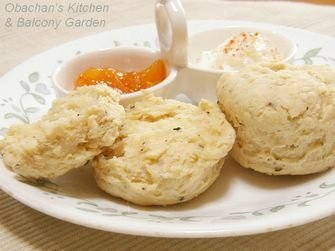 Its tangy flavor becomes a lot milder when fried. If you really want to get rid of the tanginess, I'm not very sure but soaking halved myoga in water beforehand for 5 to 10 minutes might help a little ... (or maybe not... ) Anyway, if myoga was soaked in water beforehand, it needs to be drained well and pat-dried with a paper towel before being batter-fried. I love eating myoga tempura with ten-tsuyu (dipping sauce made from dashi stock, soy sauce and mirin). But when I feel that the myoga is still too strong, I sometimes dip the tempura in ten-tsuyu first and then dip the top of if in mayonnaise and eat. This way the mayonnaise reduces the pungency of myoga some more and makes it taste milder. One more dish. I didn't make this today, but myoga is good with sumiso (vinegar-miso) dressing. 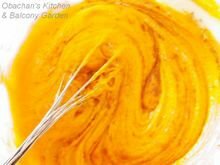 Here's a recipe for the dressing. Combine all ingredients and blend well to dissolve miso completely. 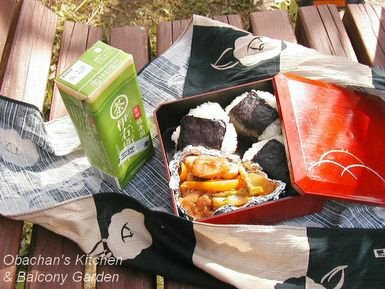 Dress sliced myoga with sumiso dressing and serve. 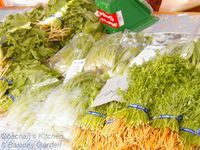 * Miso and vinegar can hide the tanginess to a good extent, but again, if you still want it less tangy, soaking in water or blanching beforehand may help, though blanching would really ruin the crispness. 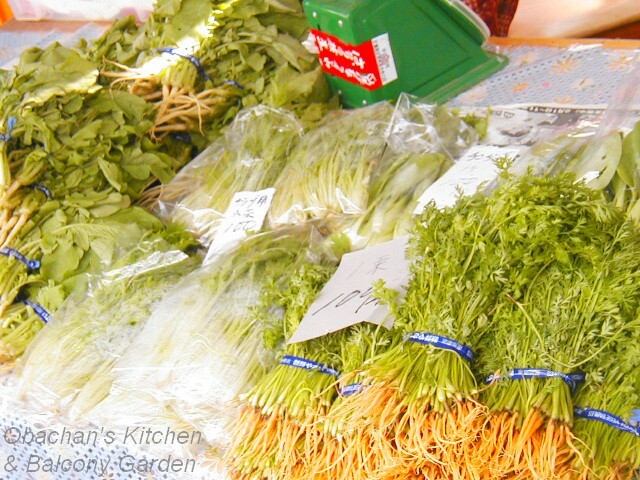 If blanched, cool completely before serving with sumiso dressing. This is how they look on the next day. Aren't they pretty? I just tried one and it was soooooooooo good! - Tag five more people to do the same. What’s your first choice when you have a lot of carrots left? At that time, my blog didn’t have many visitors. I guess I didn’t even have a site meter on my site then, IIRC. I still remember how anxiously I waited for a comment and how thrilled I was when I got one. Now I have so many frequent visitors and I really appreciate that. Thank you, dear readers. It has been about a year since I posted that entry. If I asked myself the above question now, my answer would be either of carrot custard pie, carrot jam or carrot halwa, and my decision would depend on which I feel like making the most and how much time I have. Does this mean that my culinary horizon has been broadened a bit? 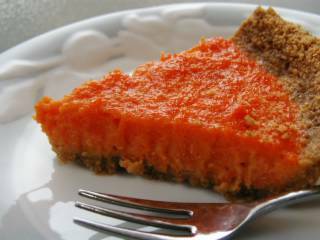 Carrot custard pie is definitely one of my favorite desserts. It’s a shame that I haven’t made this for a long time. 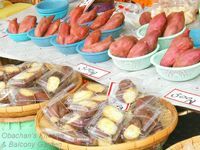 Since carrots are available throughout the year and their price doesn’t change much, I tend to put priority on using other fruits in season for desserts and end up neglecting carrots. Sorry, carrots. Seventeen days. It was obviously too long. I’m talking about my nashi (Asian pear) infused vodka. It has been seventeen days since I sank those pear segments in vodka. I should have checked it once in a while, but I just gave it a good rest in the dark in my small cupboard. In other words, I almost forgot about it. Besides, considering how long it took for my grape-infused vodka to be really flavorful, I thought I should give it 3 weeks or so. Wrong idea. I opened the jar today for the first time to check how it was doing, and I hated myself for waiting that long. The moment I smelled the vodka, I was almost shocked. It smelled sweet indeed, but not the kind of fruity sweetness that I had in mind. How should I describe it…? 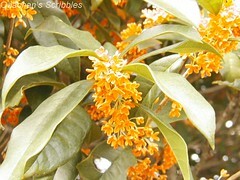 The smell reminded me of some kind of chocolate bonbons with real strong liquor in. No, I'm not saying that my vodka smelled like chocolate. You know the kind of bonbon that has a layer of coarse sugar or candy inside? The smell of my nashi infused vodka reminded me of that boozed-up coarse sugar! And it was so strong that it almost knocked me down. I strained the vodka and poured some in a glass to experiment. I added some ice and water to see if I can smell and taste the pears when it's thinned. Yes, I did, but not the way I wanted. It was not fruity at all. It was more like over-ripened pears that already lost its fragrance and is going bad pretty soon. Maybe it might taste OK if mixed with other drinks, but I had no idea what can be the right kind of drinks for that. Instead, an idea popped up in my mind. Can’t I use it for cooking? 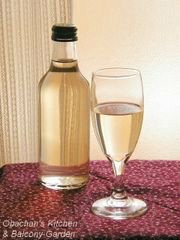 I heard about using vodka or bourbon for cooking chicken, so why not this infused vodka? 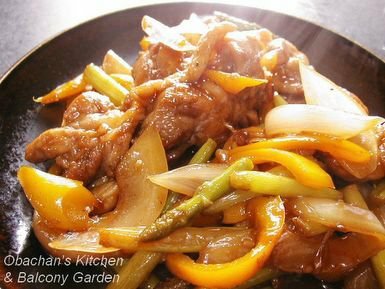 So here is a Chinese-style dish I improvised: Chicken and veggie stir-fry with good amount of Asian- pear infused vodka! 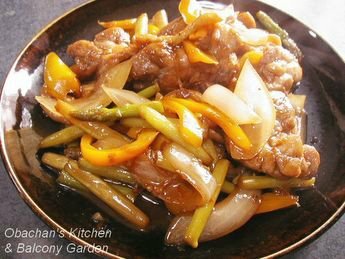 I marinated the chicken briefly in garlic, soy sauce and the vodka, then stir-fried it with minced garlic and ginger root and other vegetables. For seasoning, I used salt, pepper and about a teaspoonful Dou ban jiang (Chinese chili paste) dissolved in mirin, and at the end I added soy sauce and a good amount of my nashi- infused vodka! 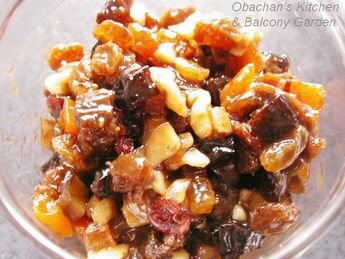 While I was stir-frying, I did smell the fruity nashi flavor a little. Maybe because the alcohol evaporated while being heated? Unfortunately I couldn’t detect the fruity flavor in the chicken when I ate it, but the dish turned out quite good. Honestly, I loved it. It was sweet, but the sweetness was a little different from what it usually is when used sugar and/or mirin only --- it was milder. Feeling good about this success, and feeling the urge to go out and eat lunch outside in gorgeous autumn weather, I packed my lunch and headed for a nearby park. 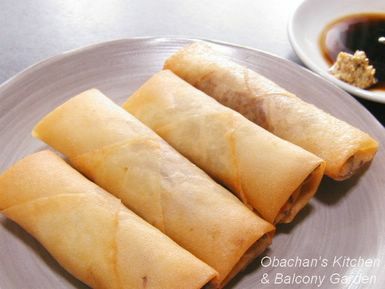 Crispy spring rolls are my all-time favorite. 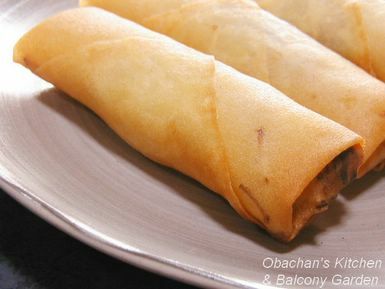 They are also great for using up leftover veggies in the fridge because you can basically roll up almost anything --- at your own risk --- and deep fry. 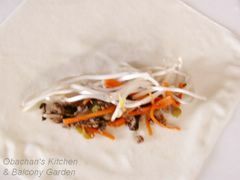 For the first batch, I used bean sprouts, carrots, ground meat (seasoned and sauteed), asparagus and shiitake mushrooms for the filling. 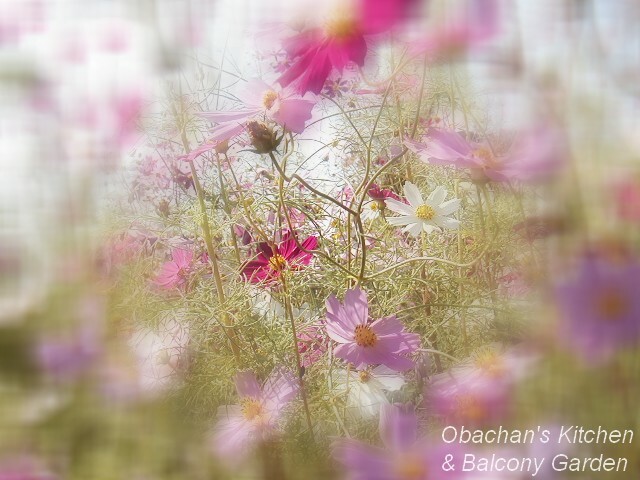 Forgive me if the combination sounded weird to you. 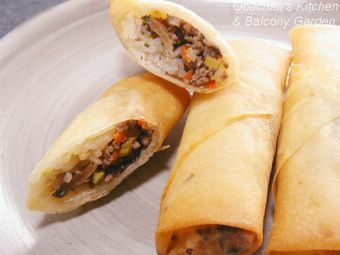 They needed to be used up, and I chose spring roll to use them up because there was another thing I wanted to make using the wrappers. OK, here’s my experiment. 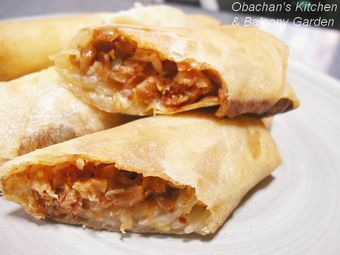 Someone said on TV the other day that natto-kimchi spring roll was great, and he recommended it to all natto-phobic people. The idea of hiding the odor/taste of natto with kimchi sounded like a good idea to me, so I gave it a try. Mmmm… I can give this 7.5 out of 10. Though I tasted natto a little, its texture and smell didn’t bother me almost at all. The crispy skin really helped. This may not be a “cure” for natto-phobia, but it did bring me one step closer to that highly nutritious food full of Nattokinase. As has been written by many, wagashi (Japanese traditional confectionery) is known for its beauty that reflects the changing seasons in Japan. It does not necessarily mean using ingredients in season like baking blueberry pie in summer. 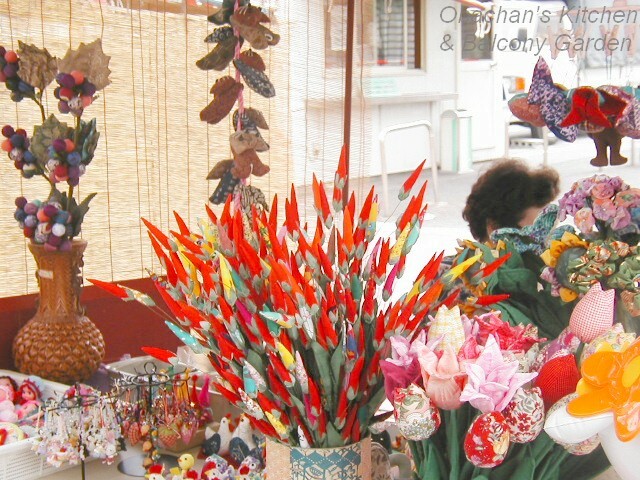 Those traditional sweets are actually shaped and colored to depict various seasonal features. 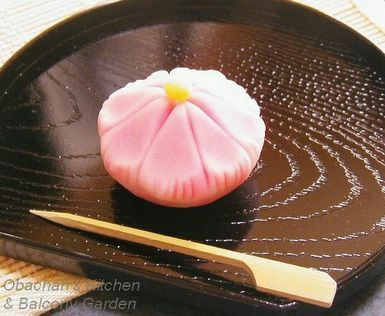 There is no doubt that tea ceremony played a crucial role in the history of wagashi. 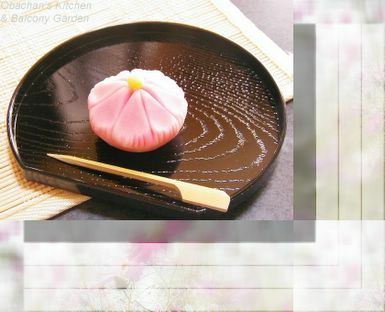 In this highly ritualized preparation and drinking of tea, seasonal themes must always be reflected on everything: equipments used for preparing/drinking tea, hanging scroll picture on the wall, flowers in a vase, and wagashi served before drinking tea. To meet this need, Japanese confectioners have been making great efforts to creatively represent seasonal themes with their wagashi. 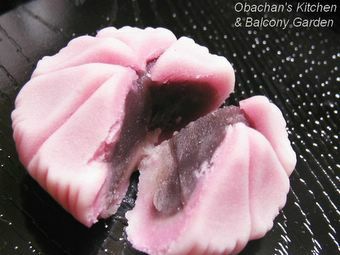 Very often, nerikiri has sweet bean paste filling inside, thus the sugar content is not very low. 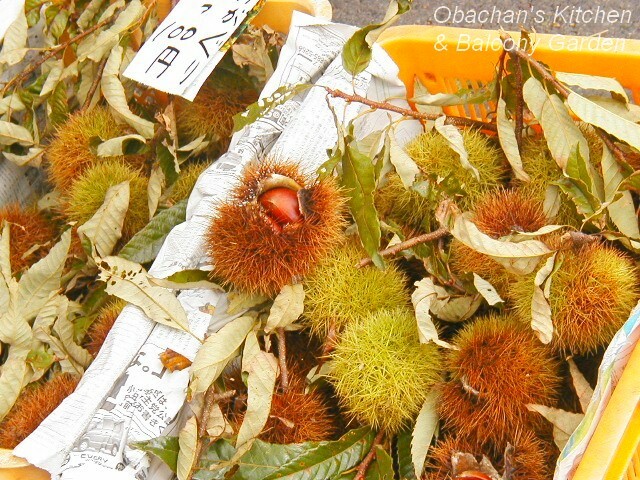 However, a good nerikiri never tastes overly sweet for me; the sweetness is not heavy but by no means too light or tasteless, which goes wonderfully well with bitter and flavorful matcha (green tea served in tea ceremony). * Mochi --- Rice cake. 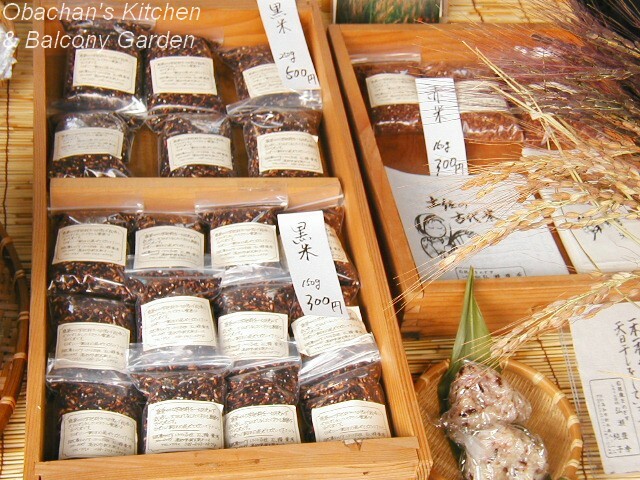 * Shiratamako --- A type of rice flour. 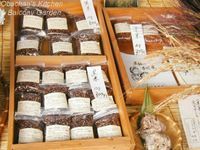 The rice is soaked into water and milled as in water (not drained), pressed to get the water out and dried into solid, then made into powder. A finer flour than mochiko. Today I found an European pear, La France on sale. The price was down to 1/5 of the original price because the pear had a big bruise almost turning brown, and the rest was rock-hard. Usually I never buy this kind of pear no matter how cheap it is, because I can't stand a rock-hard pear, but this time was different. I knew it was a perfect chance to try out the recipe I saw on crystal’s site. 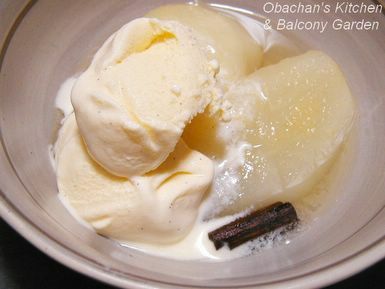 So I bought the half-rotten pear and a cup of vanilla ice cream and hurried home (I mean, my apartment). Wondering what this is? Maybe some of you figured out that this is chirashi zushi (uncaked sushi), but not sure what’s on top, right? 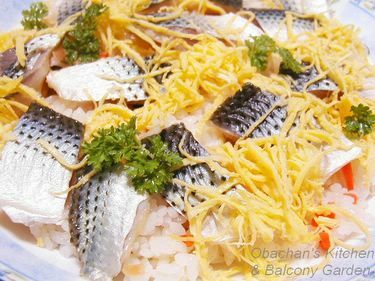 Those fish-meat like chunks are vinegared gizzard shad. Many of you probably have had sushi more often than I did, and might have heard the name kohada. That’s what it is. 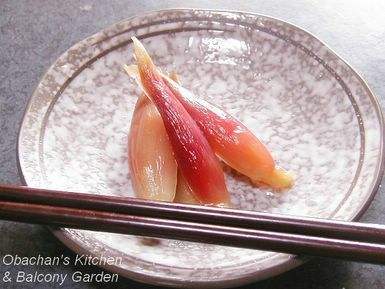 Kohada is often vinegared and I’ve heard a lot about it, but this was the first time that I made vinegared kohada myself. And this boiled fish is what we call chinu (black sea bream). 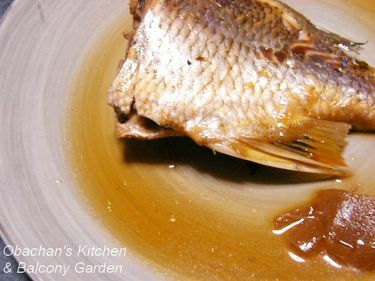 I had a hard time taking a shot trying to hide the ugly parts as much as possible, because the skin came off here and there... :( Very simple sweet and salty seasoning with sugar, soy sauce, sake, mirin and a few slices of ginger root. Why did I go through all those troubles this time? Let me tell you, dear readers. These fish were special. They were not from the supermarket. They were straight from a local river, and I witnessed all the catching process! My kitchen is filled with the smell of fish right now. I’m not totally happy with it, but I have to admit that it makes me feel somewhat nostalgic. After all, that’s something I was very familiar with in my childhood. * And here is the story of how I got these fish. 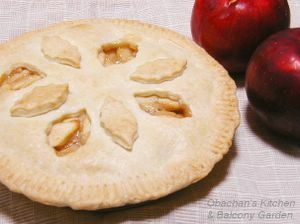 Take a look at the double-crust apple pie that I made yesterday! It was my very first time making pie crust myself. 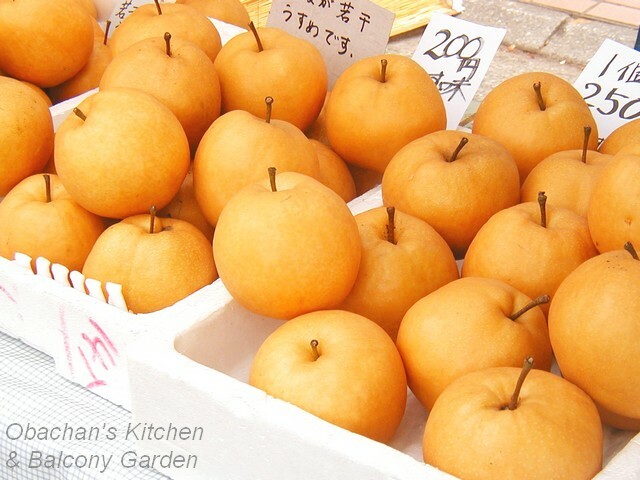 The temptation to bake an apple pie was triggered when I saw several kogyoku apples on sale at the Sunday market yesterday. 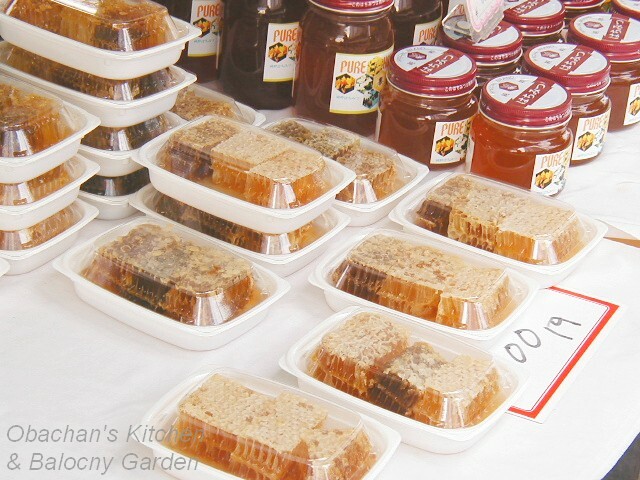 Kogyoku is a tart variety that is suitable for pies and cakes. 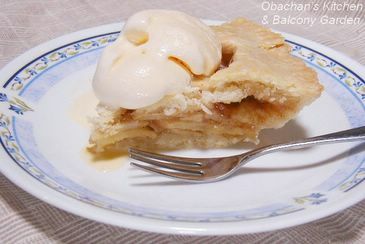 For someone like me who wants tart apples for baking but can’t buy Granny smith online, Kogyoku is the best substitute. 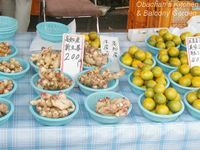 (Granny smith apples are not available at regular stores in Japan but you can buy them from farmers by ordering online. Most likely you have to order by box and the postage will not be cheap.) 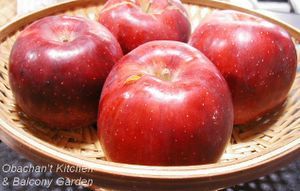 So can you imagine how delighted I was when I found kogyoku apples on sale: 4 for 100 yen (apx. US$1.00)?! Usually 4 Kogyoku apples cost almost 500 yen at supermarkets. 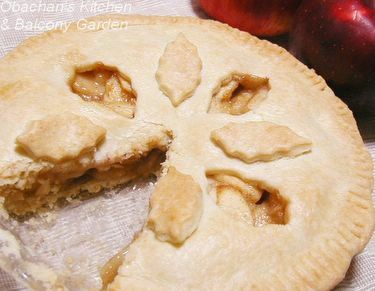 For my very first double-crust apple pie, I picked a basic recipe to stay on the safe side because I am not very experienced in apple-pie baking. 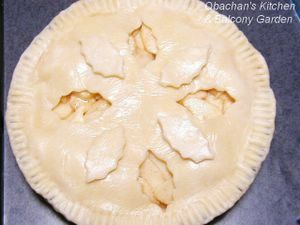 But there was one thing I was determined to do no matter what; I wanted to bake a double-crust pie with leaf-shaped holes in the top crust. And see? I really had fun making the holes using my leaf-shaped cookie cutter. Though it is still quite warm and humid around here for October, fresh fruits and vegetables at the market tell us that it’s Autumn now. I'm happy to see wider variety of grapes sold at stores these days. 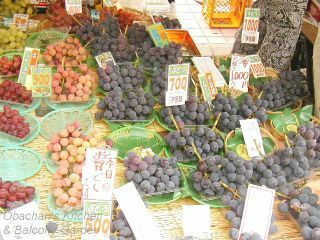 In the past, we only had grapes with thick skins in Japan (or at least in Shikoku, I guess) and we never ate the skins. So I was shocked when I saw, for the first time, people eating grape skins in the U.S. Now we have grapes with thin skins here in Kochi, too, and my mom wouldn’t be frightened to see her daughter eating up grapes, leaving seeds and stems only. I always love to see the crafts at this stall. When I was a kid, one of my dreams was having my own chestnut tree so that I would be able to eat chestnuts anytime I want. 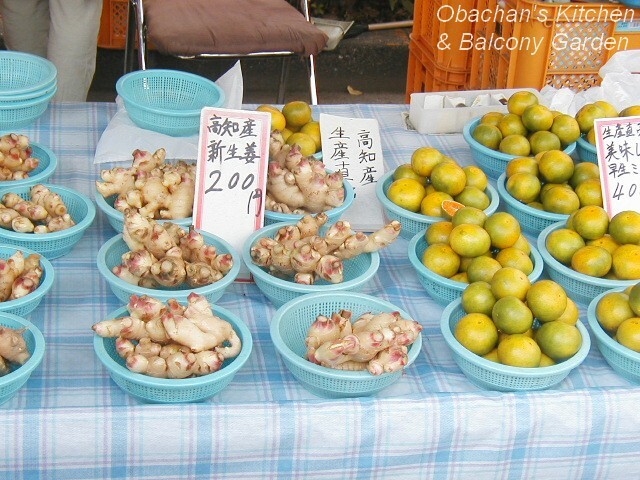 Big Asian pears, ginger roots and early tangerines. Honeycombs& honey, and of course, sweet potatoes!